The vacuum packaging machine is designed for sealing contents in vacuum pouches Vacuum bags. It is equipped with an electronic pressure sensor to assure steady control of vacuum and gas packaging functions. Plus, a letter and number kit is included which will allow date and text message identification to be embedded in the seal of each package. A great way to set "freshness" markings. The vacuum Packaging, Vacuum Chamber. Is available with a manual or digital control panel that is programable to memorize frequent operations. 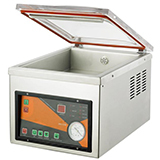 The Vacuum packing machine has a long, wide chamber with a center depression allowing for thin edges and thick center packages. The Heat sealer seal large and heavy pouches. 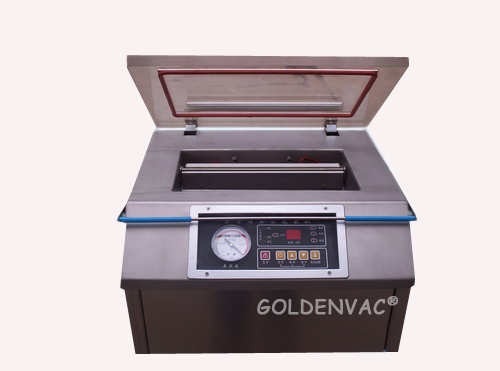 The Food vacuum packing machine has a very strong vacuum pump so no gas injection is required.